Second only to telemarketers, chatting with a liquidator isn’t on most people’s ‘to do’ list. Well, this national insolvency firm is doing things differently by firstly never making cold calls to business owners to see how their fees can be inflated from the demise of their profits, but rather we’re hosting complimentary Conference events for business advisors to show them how businesses can not only survive, but thrive. 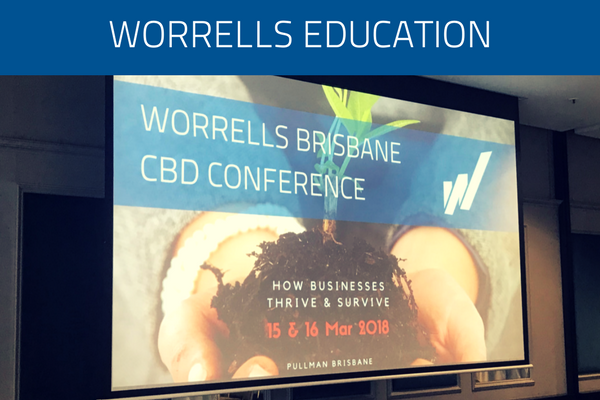 In March, over 200 accountants and solicitors from a range of practices across South East Queensland and Central Queensland flocked to Worrells’ Brisbane CBD Conference. Held for two days, for the exclusive audience of these practitioners, Worrells hosted a range of expert speakers to share their insights into how businesses thrive and survive through different approaches and disciplines. Usually associated with the downfall of businesses as the ‘corporate undertaker’, Worrells believes its 45-year history in administering personal and corporate insolvencies, across a cross-section of industries across Australia, gives them the gift of retrospect. And by being a brand of insolvency practitioners that are compelled to be part of reframing their relevance and usefulness to the business community, we give the gift of complimentary education. Under most professional bodies required certified professional development programs, this education can come at a high expense. Many delegates told Worrells that they were grateful to receive a range of professional development points in one neat and enjoyable package. In her closing remarks, Conference speaker, Samantha Dean from BlueprintHQ said “Most events focus largely on building the technical capabilities of advisors or in compliance matters. It’s a great opportunity for delegates to be immersed in big picture discussions with the information and tools to support it”. Samantha also urged delegates to consider being in regular dialogue with Worrells to assist them with their clients’ financial challenges, before it becomes too much of a challenge to overcome. She also offered her spin on using storytelling to give clients advice. Her ‘Business Advisory Capability Wheel’ exercise showed delegates how to uncover a snapshot of where their firm ranks to become an ‘advisory’ firm, which is touted to be the future for the accountants’ profession. Speaking to Worrells, Conference speaker, Tanya Titman from Consolid8 said, “She was delighted to see the diversity of topics offered, and sees great value for practitioners to gain by attending Worrells Conferences”. Tanya shared her secrets on how using Extended DISC changed the dynamics and effectiveness of her teams, and how adding a custom bot for their Slack Messenger can emotionally support staff members as and when they need it. Among other expert speakers, Worrells procured a ‘Senior Fixed Income Strategist’, Philip Brown from the CBA rather than an event staple of ‘the economist’, which gave refreshing insight on the Australian Market Update with “A recovery that’s not firing on all cylinders”. And, as you would expect from experienced event hosts and proud makers of advisor education, we tailored our presentations to the respective audiences of accountants versus solicitors. Brisbane Partners, Chris Cook and Nikhil Khatri, highlighted the current tensions between trust and insolvency law by aptly naming their presentation “Trusts & Insolvency: A Collision Course”. They shared their insights into the current state-of-play and how their bankruptcy case could become leading case law as various Courts are set to tackle this issue. Gold Coast and Northern Rivers Partner, Jason Bettles, polled the audience live to establish some fallacies held on preference payments and secured creditors, and on the flipside, which stakeholders within a business are exposed. He outlined protection strategies for Accountants, including how to protect their fees, and how to react to a demand. Keynote speaker, Dave Chaffey from Kochie’s Business Builders TV show, shared his experience of having been bought-out rather swiftly by the now known franchise of Specsavers; and he pressed delegates to consider what existing technology could be adapted in their business to, in his analogy, “to Trap a Bear”. We hope our latest Conferences ‘How Businesses Thrive & Survive’ will help the business community to reframe Worrells as being the educators, not the undertakers. To sign up for Worrells’ advisor education event invitations click here.